Is Testing for Radon a Health or Financial Decision? When it comes to testing for radon, there is a big divide between those who believe in its negative effects on health and those who are convinced that the effects are either non-existent or very minimal. The primary reason why I first began testing homes was due to the high demand for radon testing in the Champaign area and the fact that there were not enough testers to serve the needs of the region. I didn’t know much about radon or its health effects at the time, but if a client wanted the test, I was going to use the best equipment available to give them the most accurate answer. 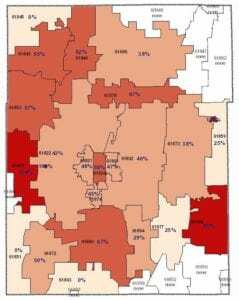 Radon is in every house and in our own area, there is a high probability that the level will surpass 4.0 pCi/L, which is a unit used to measure radioactive concentrations. The U.S. Environmental Protection Agency (EPA) recommends that once a home reaches this particular level, it should be mitigated as soon as possible. Considering the fact that overexposure to radon has now been named the second leading cause of lung cancer in the United States, you may decide that testing your home would be beneficial for your health – just in case. With that being said, let’s look at this from another angle. When I started offering this service in 2006, I was performing a radon test in about one out of every ten home inspections. With the Illinois Radon Awareness Act being put into effect in 2008 however, we saw that number increase to three out of every ten, and now to four or five out of ten in 2013. As you can see, the number continues to grow and it is my prediction that we will begin to see all houses tested in the near future. So at some point, when you go to sell the house you are now purchasing, there is a good chance that it will need to be tested and you may even have to pay for the mitigation system ($1,200-$3,000). So why not just test now and have a win-win situation? Not only can you negotiate who will pay for the mitigation system in your new house, but you will also get the additional benefit of having a healthy house with minimal radon levels for you and your family to enjoy for years to come. Call Pristine Inspections & Testing today for more information.